Geometry-Aware Scattering Compensation for 3D Printing. Denis Sumin, Tobias Rittig, Vahid Babaei, Thomas Nindel, Alexander Wilkie, Piotr Didyk, Bernd Bickel, Jaroslav Křivánek, Karol Myszkowski, Tim Weyrich. Conditionally accepted to ACM Transactions on Graphics (Proc. SIGGRAPH), 38(? ), 14 pages, 2019. Neural BTF Compression and Interpolation. Gilles Rainer, Wenzel Jakob, Abhijeet Ghosh, Tim Weyrich. To appear in Computer Graphics Forum (Proc. Eurographics), 38(2), 10 pages, 2019. Mould Store: Exploring The Preservation of The Former Spode Factory's Post-Industrial Heritage Through Digital Technologies. Neil Brownsword, Tim Weyrich, Karina Rodriguez Echavarria. Celebrating Reproductions: Past, Present and Future, Victoria and Albert Museum, London, UK, 17–19 January 2019. Conscious Digitisation: Supporting The Conservation And Interpretation of The V&A’s Collection of Large-Scale Reproductions. Kira Zumkley, Karina Rodriguez Echavarria, Tim Weyrich, Marion Crick, Charlotte Hubbard, Sarah Healey. Poster at Celebrating Reproductions: Past, Present and Future, Victoria and Albert Museum, London, UK, 17–19 January 2019. Learning on the Edge: Explicit Boundary Handling in CNNs. Proc. 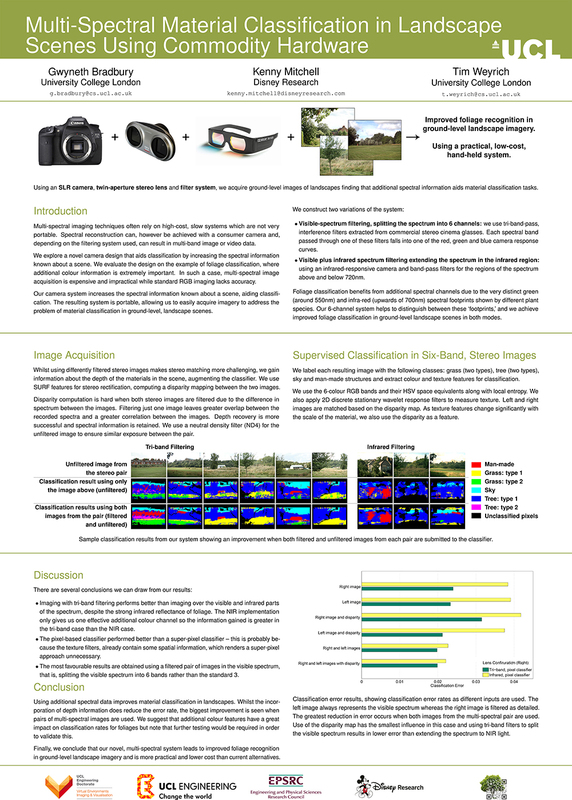 British Machine Vision Conference (BMVC), 11 pages, Sep 2018. Comprehensive Use of Curvature For Robust And Accurate Online Surface Reconstruction. Damien Lefloch, Markus Kluge, Hamed Sarbolandi, Tim Weyrich, Andreas Kolb. In IEEE Transactions on Pattern Analysis and Machine Intelligence (PAMI), 39(12), pp. 2349–2365, 2017. Scattering-aware Texture Reproduction for 3D Printing. Oskar Elek, Denis Sumin, Ran Zhang, Tim Weyrich, Karol Myszkowski, Bernd Bickel, Alexander Wilkie, Jaroslav Křivánek. ACM Transactions on Graphics (Proc. SIGGRAPH Asia), 36(6), 241:1–241:15, 2017. Object-Based Teaching And Learning For A Critical Assessment of Digital Technologies In Arts And Cultural Heritage. Mona Hess, Daniel Garside, Tonya Nelson, Stuart Robson, Tim Weyrich. International Archives of the Photogrammetry, Remote Sensing and Spatial Information Sciences (ISPRS), XLII-2/W5, 349–354, Ottawa, August 2017. Computer Graphics Forum (Proc. Eurographics Symposium on Rendering), 36(4), pp. 15–25, July 2017. Image-based Remapping of Material Appearance. Alejandro Sztrajman, Jaroslav Křivánek, Alexander Wilkie, Tim Weyrich. Proc. 5th Workshop on Material Appearance Modeling, pp. 5–8, Helsinki, June 2017. Texture Stationarization: Turning Photos into Tileable Textures. Joep Moritz, Stuart James, Tom S. F. Haines, Tobias Ritschel, Tim Weyrich. Computer Graphics Forum (Proc. Eurographics), 36(2), 13 pages, 2017. Digitally Reconstructing The Great Parchment Book: 3D recovery of fire-damaged historical documents. Kazim Pal, Nicola Avery, Pete Boston, Alberto Campagnolo, Caroline De Stefani, Helen Matheson-Pollock, Daniele Panozzo, Matthew Payne, Christian Schüller, Chris Sanderson, Chris Scott, Philippa Smith, Rachel Smither, Olga Sorkine-Hornung, Ann Stewart, Emma Stewart, Patricia Stewart, Melissa Terras, Bernadette Walsh, Laurence Ward, Liz Yamada, Tim Weyrich. Literary and Linguistic Computing: the journal of digital scholarship in the humanities, pp. 1–31, Oxford University Press, December 2016. Interactivity and User Engagement in Art Presentation Interfaces. Jeni Maleshkova, Matthew Purver, Tim Weyrich, Peter W. McOwan. Book chapter in Curating the Digital: Space for Art and Interaction, pp. 107–123, Springer, 2016. Investigating Design and Evaluation Guidelines for Interactive Presentation of Visual Art. Book chapter in Curating the Digital: Space for Art and Interaction, pp. 125–147, Springer, 2016. GitHub repository https://github.com/thaines/helit/tree/master/ms, Feburary 2016. My Text in Your Handwriting. Tom S. F. Haines, Oisin Mac Aodha, Gabriel J. Brostow. Accepted to ACM Transactions on Graphics, 2016. Gwyneth A. Bradbury, Kartic Subr, Charalampos Koniaris, Kenny Mitchell, Tim Weyrich. Journal of Computer Graphics Techniques (JCGT), 4(4), 28–53, November 2015. Invited for oral presentation at i3D 2016. The value of critical destruction: Evaluating multispectral image processing methods for the analysis of primary historical texts. Alejandro Giacometti, Alberto Campagnolo, Lindsay MacDonald, Simon Mahony, Stuart Robson, Tim Weyrich, Melissa Terras, Adam Gibson. In Digital Scholarship in the Humanities, pp. 1–22, October 2015. A Survey of Geometric Analysis in Cultural Heritage. Ruggero Pintus, Kazim Pal, Ying Yang, Tim Weyrich, Enrico Gobbetti, Holly Rushmeier. In Computer Graphics Forum, August 6, pp. 1–28, August 2015. Two-Shot SVBRDF Capture for Stationary Materials. Miika Aittala, Tim Weyrich, Jaakko Lehtinen. In ACM Transactions on Graphics (Proc. SIGGRAPH), Vol. 34, No. 4, pp. 110:1–110:13, August 2015. The British Library Big Data Experiment: Experimental Interfaces, Experimental Teaching. James Baker, Melissa Terras, Dean Mohamedally, Tim Weyrich, Adam Farquhar, Stefan Alborzpour, Stelios Georgiou, Nektaria Stavrou, Wendy Wong, Jonathan Lloyd, Meral Sahin, Divya Surendran, James Durrant, Muhammad Rafdi, Ali Sarraf. Poster at Digital Humanities 2015, Sidney, Australia, 29 June–3 July 2015. Damien Lefloch, Tim Weyrich, Andreas Kolb. In Proc. of Intl. Conference on Information Fusion (Fusion), pp. 1–9, Washington, D.C., USA, July 2015. Verification-Minimal Assembly of Fragmented Frescoes. Antonio García Castañeda, Benedict Brown, Szymon Rusinkiewicz, Thomas Funkhouser, Tim Weyrich. In 43rd Conf. Computer Applications and Quantitative Methods in Archaeology (CAA) Posters, Siena (Italy), March 2015. Alejandro Giacometti, Adam Gibson, Mona Hess, John Hindmarch, Lindsay MacDonald, Kazim Pal, Stuart Robson, Melissa Terras, Tim Weyrich. In Proc. Annual Conference of Association for Historical and Fine Art Photography (AHFAP), London, UK, 27 November 2014. Frequency-Based Editing for Terrain Generation. Gwyneth A. Bradbury, Il Choi, Cristina Amati, Kenny Mitchell, Tim Weyrich. In Proc. of 11th European Conference on Visual Media Production (CVMP), pp. 1–10, London, UK, 13–14 November 2014. Geometric Analysis in Cultural Heritage. In Proceedings of Eurographics Workshops on Graphics and Cultural Heritage, State-of-the-Art Report (STAR), pp. 1–17, Darmstadt, Germany, Germany, Oct 6–8, 2014. In Report from Dagstuhl Seminar 14361 on Computational Aspects of Fabrication, (M. Alexa, B. Bickel, S. McMains, H. E. Rushmeiner, editors), ISSN 2192-5283, pp. 145–145, 31 Aug – 5 Sep, 2014. A Study of Image Colourfulness. Cristina Amati, Niloy J. Mitra, Tim Weyrich. In Proc. of Expressive (CAe+SBIM+NPAR), 9 pages, Vancouver, Canada, 8–10 August 2014. Kazim Pal, Christian Schüller, Daniele Panozzo, Olga Sorkine-Hornung, Tim Weyrich. Computer Graphics Forum (Proc. Eurographics), 33(2), 9 pages, 2014. Visualising Macroscopic Deterioration of Parchment and Writing via Multispectral Images. Alejandro Giacometti, Alberto Campagnolo, Lindsay MacDonald, Simon Mahony, Melissa Terras, Stuart Robson, Tim Weyrich, Adam Gibson. Paper presented at the Care and Conservation of Manuscripts (CCM) conference, University of Copenhagen, Denmark, April 2–4, 2014. Reassembling Roman Plaster Fragments from Flanders Using Three-Dimensional Scanning and Automatic Matching. Lara Laken, Benedict Brown, Marc Proesmans, Alain Vanderhoeven, Marc De Bie, Luc van Gool, Tim Weyrich. 115th Annual Meeting of Archaeological Institute of America, 2–5 January, 2014. Supporting Interoperability and Presence Awareness in Collaborative Mixed Reality Environments. Oyewole Oyekoya, Ran Stone, William Steptoe, Laith Alkurdi, Stefan Klare, Angelika Peer, Tim Weyrich, Benjamin Cohen, Franco Tecchia, Anthony Steed. In Proc. of 19th ACM Symposium on Virtual Reality Software and Technology (VRST), 6–9 October 2013. Multi-Spectral Material Classification in Landscape Scenes Using Commodity Hardware. Gwyneth A. Bradbury, Kenny Mitchell, Tim Weyrich. Lecture Notes in Computer Science (Proc. Conf. on Computer Analysis of Images and Patterns, CAIP), 8048, pp. 209–216, August 2013. 3D Reconstruction For Damaged Documents: Imaging of The Great Parchment Book. Kazim Pal, Melissa Terras, Tim Weyrich. In Proc. of 2nd Intl. Workshop on Historical Document Imaging and Processing, pp. 14–21, Washington DC, 24 August, 2013. Practical SVBRDF Capture In The Frequency Domain. ACM Transactions on Graphics (Proc. SIGGRAPH), 32(4), 12 pages, 2013. City of London, London Metropolitan Archives XML Transcription of the Great Parchment Book of The Honourable The Irish Society. Patricia Stewart, Nicola Avery, Philippa Smith, Melissa Terras, Matthew Payne, Tim Weyrich. UCL Discovery https://rps.ucl.ac.uk/viewobject.html?cid=1&id=1406687, July 2013 (at this URL since July 2017). Nicola Avery, Alberto Campagnolo, Caroline De Stefani, Kazim Pal, Matthew Payne, Philippa Smith, Rachael Smither, Ann Marie Stewart, Emma Stewart, Patricia Stewart, Melissa Terras, Laurence Ward, Tim Weyrich, Elizabeth Yamada. Poster presentation at Digital Humanities 2013, University of Nebraska, Lincoln. July 2013. Colour Analysis of Degraded Parchment. Lindsay MacDonald, Alejandro Giacometti, Tim Weyrich, Melissa Terras, Adam Gibson. Congress of the International Colour Association (AIC), Newcastle Upon Tyne, UK, July 2013. Real-time 3D Reconstruction in Dynamic Scenes using Point-based Fusion. Maik Keller, Damien Lefloch, Martin Lambers, Shahram Izadi, Tim Weyrich, Andreas Kolb. In Proc. of Joint 3DIM/3DPVT Conference (3DV), 8 pages, Seattle, USA, June 2013. Interactive Exploration and Flattening of Deformed Historical Documents. Computer Graphics Forum (Proc. Eurographics), 32(2), pp. 327–334, 2013. Computational Fabrication and Display of Material Appearance. Matthias B. Hullin, Ivo Ihrke, Wolfgang Heidrich, Tim Weyrich, Gerwin Damberg, Martin Fuchs. Eurographics State-of-the-Art Reports (STAR), Girona, Spain, May 2013. Fabrizio Pece, William Steptoe, Fabian Wanner, Simon Julier, Tim Weyrich, Jan Kautz, Anthony Steed. In Proc. of ACM SIGCHI Conference on Human Factors in Computing Systems (CHI), pp. 1319–1328, 2013. ACM SIGCHI Best paper Honourable Mention Award. Documenting and Interpreting Parchment Deterioration by Visual Analysis and Multispectral Imaging. Alberto Campagnolo, Alejandro Giacometti, Lindsay MacDonald, Simon Mahony, Melissa Terras, Stuart Robson, Tim Weyrich, Adam Gibson. Icon PF13, Positive Futures in an Uncertain World, Glasgow, 10–12 April 2013.
International Conference on Computational Photography (ICCP) 2013 Posters, Cambridge, MA, 19–21 April 2013. Multispectral imaging of degraded parchment. Lindsay MacDonald, Alejandro Giacometti, Alberto Campagnolo, Stuart Robson, Tim Weyrich, Melissa Terras, Adam Gibson. Lecture Notes in Computer Science (including subseries Lecture Notes in Artificial Intelligence and Lecture Notes in Bioinformatics), 7786, pp. 143–157, March 2013. 3D-Printing of Non-Assembly, Articulated Models. Jacques Cali, Dan Calian, Cristina Amati, Rebecca Kleinberger, Anthony Steed, Jan Kautz, Tim Weyrich. ACM Transactions on Graphics (Proc. SIGGRAPH Asia), 31(6), pp. 130:1–130:8, 2012. Acting Rehearsal in Collaborative Multimodal Mixed Reality Environments. William Steptoe, Jean-Marie Normand, Oyewole Oyekoya, Fabrizio Pece, Elias Giannopoulos, Franco Tecchia, Anthony Steed, Tim Weyrich, Jan Kautz, Mel Slater. PRESENCE: Teleoperators and Virtual Environments, 21(4), pp. 406–422, 2012. Beaming: An Asymmetric Telepresence System. Anthony Steed, William Steptoe, Oyewole Oyekoya, Fabrizio Pece, Tim Weyrich, Jan Kautz, Doron Friedman, Angelika Peer, Massimiliano Solazzi, Franco Tecchia, Massimo Bergamasco, Mel Slater. IEEE Computer Graphics and Applications, 32(6), pp. 10–17, 2012. Analyzing and Simulating Fracture Patterns of Theran Wall Paintings. Hijung Shin, Christos Doumas, Thomas Funkhouser, Szymon Rusinkiewicz, Kenneth Steglitz, Andreas Vlachopoulos, Tim Weyrich. ACM Journal of Computing and Cultural Heritage (JOCCH), 5(3), pp. 10:1–10:14, 2012. Newton Spectrum: Nonlinear Text Browsing of a Large Corpus. William Martin, Dani Abdallah, Ahmed El-Abiary, Yosef Dalbah, Simon Julier, Melissa Terras, Rob Iliffe, Michael Hawkins, Tim Weyrich. In Proc. of Digital Humanities Congress 2012, The University of Sheffield, September 2012. Tools for Virtual Reassembly of Fresco Fragments. Benedict Brown, Lara Laken, Philip Dutré, Luc van Gool, Szymon Rusinkiewicz, Tim Weyrich. International Journal of Heritage in the Digital Era, Vol. 1, No. 2, pp. 313–330, 2012. A fully immersive set-up for remote interaction and neurorehabilitation based on virtual body ownership. Daniel Perez-Marcos, Massimiliano Solazzi, William Steptoe, Oyewole Oyekoya, Antonio Frisoli, Tim Weyrich, Anthony Steed, Franco Tecchia, Mel Slater, Maria V. Sanchez-Vives. Frontiers in Neurology, Vol. 3, No. 110, pp. 1–9, 2012. Cultural heritage destruction: Documenting parchment degradation via multispectral imaging. In Proc. of Electronic Visualisation and the Arts (EVA 2012), pp. 301–308, July 2012. Global Consistency in the Automatic Assembly of Fragmented Artefacts. In Proc. of 12th Intl. Symposium on Virtual Reality, Archaeology and Cultural Heritage (VAST), Prato (Italy), October 2011. Adapting Standard Video Codecs for Depth Streaming. Fabrizio Pece, Jan Kautz, Tim Weyrich. In Proc. of Joint Virtual Reality Conference of EuroVR (JVRC), pp. 1–8, Nottingham, UK, Sep 2011. Marios Papas, Wojciech Jarosz, Wenzel Jakob, Szymon Rusinkiewicz, Wojciech Matusik, Tim Weyrich. Computer Graphics Forum (Proc. Eurographics 2011), Vol. 30, No. 2, pp. 503–511, June 2011. Capturing Time-of-Flight Data with Confidence. Malcolm Reynolds, Jozef Dobos, Leto Peel, Tim Weyrich, Gabriel Brostow. In Proc. of IEEE Conference on Computer Vision and Pattern Recognition (CVPR), pp. 1–8, Colorado Springs, June 2011. Learning How to Match Fresco Fragments. Thomas Funkhouser, Hijung Shin, Corey Toler-Franklin, Antonio García Castañeda, Benedict Brown, David Dobkin, Szymon Rusinkiewicz, Tim Weyrich. In Eurographics 2011 Special Area Track on Cultural Heritage, April 2011. Multi-Feature Matching of Fresco Fragments. Corey Toler-Franklin, Benedict Brown, Tim Weyrich, Thomas Funkhouser, Szymon Rusinkiewicz. ACM Transactions on Graphics (Proc. SIGGRAPH Asia), Vol. 29, No. 5, pp. 185:1–185:11, Seoul, 2010. A Practical Appearance Model for Dynamic Facial Color. Jorge Jimenez, Timothy Scully, Nuno Barbosa, Craig Donner, Xenxo Alvarez, Teresa Vieira, Paul Matts, Veronica Orvalho, Diego Gutierrez, Tim Weyrich. ACM Transactions on Graphics (Proc. SIGGRAPH Asia), Vol. 29, No. 5, pp. 141:1–141:8, Seoul, 2010. In Proc. of 7th Intl. Conference on Science and Technology in Archaeology and Conservations, pp. 1–10, December 2010. Towards A Spatio-Temporal Appearance Model For Human Skin. Proceedings of the 2010 ACM Workshop on Surreal Media and Virtual Cloning (SMVC), pp. 47--48, Firenze, Italy, 2010. Digital Historical Research: An Ideal Case Study for Networked Visualisation Research. Michael Hawkins, Simon Julier, Robert Iliffe, Tim Weyrich, Melissa Terras, Claire Warwick. In NATO Workshop on Visualising Networks: Coping With Change And Uncertainty (IST-093/RWS-015), 2010. Density-based Outlier Rejection in Monte Carlo Rendering. Christopher DeCoro, Tim Weyrich, Szymon Rusinkiewicz. Computer Graphics Forum (Proc. of Pacific Graphics), Vol. 29, No. 7, pp. 7:1–7:7, September 2010. Analyzing Fracture Patterns in Theran Wall Paintings. In Proc. of 11th Intl. Symp. on Virtual Reality, Archaeology and Cultural Heritage (VAST), September 2010. Motion Blur for EWA Surface Splatting. Simon Heinzle, Johanna Wolf, Yoshihiro Kanamori, Tim Weyrich, Tomoyuki Nishita, Markus Gross. Computer Graphics Forum (Proc. Eurographics 2010), Vol. 29, No. 2, pp. 733–742, June 2010. Fabricating Microgeometry for Custom Surface Reflectance. Tim Weyrich, Pieter Peers, Wojciech Matusik, Szymon Rusinkiewicz. ACM Transactions on Graphics (Proc. SIGGRAPH), New Orleans, LA, 2009. Modeling Human Color Perception under Extended Luminance Levels. Min H. Kim, Tim Weyrich, Jan Kautz. ACM Transactions on Graphics (Proc. SIGGRAPH), Vol. 28, No. 3, pp. 27:1–27:9, New Orleans, LA, 2009. Fingerprinting Blank Paper Using Commodity Scanners. William Clarkson, Tim Weyrich, Adam Finkelstein, Nadia Heninger, J. Alex Halderman, Edward W. Felten. In Proc. of IEEE Symposium on Security and Privacy, 17–20 May 2009, Berkeley, CA. Principles of Appearance Acquisition and Representation. Tim Weyrich, Jason Lawrence, Hendrik P. A. Lensch, Szymon Rusinkiewicz, Todd Zickler. Foundations and Trends in Computer Graphics and Vision, Vol. 4, No. 2, pp. 75-191, 2008 (appeared in 2009). A Layered, Heterogeneous Reflectance Model for Acquiring and Rendering Human Skin. Craig Donner, Tim Weyrich, Eugene d’Eon, Ravi Ramamoorthi, Szymon Rusinkiewicz. ACM Transactions on Graphics (Proc. SIGGRAPH Asia), Vol. 27, No. 5, pp. 140:1–140:12, Singapore, 2008. A System for High-Volume Acquisition and Matching of Fresco Fragments: Reassembling Theran Wall Paintings. Benedict Brown, Corey Toler-Franklin, Diego Nehab, Michael Burns, Andreas Vlachopoulos, Christos Doumas, David Dobkin, Szymon Rusinkiewicz, Tim Weyrich. ACM Transactions on Graphics (Proc. SIGGRAPH), Vol. 26, No. 3, pp. 84:1–84:9, Los Angeles, CA, 2008. Class SIGGRAPH 2008, Los Angeles, CA, August 2008. Dense 3D Reconstruction from Specularity Consistency. Diego Nehab, Tim Weyrich, Szymon Rusinkiewicz. In Proc. of IEEE Conference on Computer Vision and Pattern Recognition (CVPR), pp. 1–8, Anchorage, AK, 2008. Short Course ICCV 2007, Rio de Janeiro, Brazil, October 2007. Tim Weyrich, Matthias Zwicker, Mark Pauly, Markus Gross, Martin Wicke, Leif Kobbelt. Book chapter in Point-Based Graphics, pp. 186–244, Morgan Kaufmann, 2007. Digital Bas-Relief From 3D Scenes. Tim Weyrich, Jia Deng, Connelly Barnes, Szymon Rusinkiewicz, Adam Finkelstein. ACM Transactions on Graphics (Proc. SIGGRAPH), 26, 3 (Jul. 2007), 32 (7 pp. ), Los Angeles, CA, 2007. A Hardware Architecture for Surface Splatting. Tim Weyrich, Simon Heinzle, Timo Aila, Daniel B. Fasnacht, Stephan Oetiker, Mario Botsch, Cyril Flaig, Simon Mall, Kaspar Rohrer, Norbert Felber, Hubert Kaeslin, Markus Gross. In ACM Transactions on Graphics (Proc. SIGGRAPH), 26, 3 (Jul. 2007), 90:1–90:11, Los Angeles, CA, 2007. In Proceedings of Dagstuhl Seminar 07171 on Visual Computing 2007, ISSN 1862-4405, Dagstuhl, Germany, April 2007. Implementation Sketch: Processing and Editing of Faces using a Measurement-Based Skin Reflectance Model. Bernd Bickel, Tim Weyrich, Wojciech Matusik, Hanspeter Pfister, Craig Donner, Chien Tu, Janet McAndless, Jinho Lee, Addy Ngan, Henrik Wann Jensen, Markus Gross. Sketch ACM SIGGRAPH 2006, Boston, USA, July 2006. Analysis of Human Faces using a Measurement-Based Skin Reflectance Model. Tim Weyrich, Wojciech Matusik, Hanspeter Pfister, Bernd Bickel, Craig Donner, Chien Tu, Janet McAndless, Jinho Lee, Addy Ngan, Henrik Wann Jensen, Markus Gross. ACM Transactions on Graphics (Proc. SIGGRAPH), pp. 1013–1024, Boston, MA, July 2006. GPU-Based Ray Casting of Quadratic Surfaces. Christian Sigg, Tim Weyrich, Mario Botsch, Markus Gross. In Proceedings of Eurographics Symposium on Point-Based Graphics, July 29-30, 2006, Boston. Acquisition of Human Faces Using A Measurement-Based Skin Reflectance Model. PhD thesis No. 16741, Department of Computer Science, ETH Zürich, 2006. Measuring Skin Reflectance and Subsurface Scattering. Tim Weyrich, Wojciech Matusik, Hanspeter Pfister, Addy Ngan, Markus Gross. Mitsubishi Electric Research Laboratories (MERL) Technical Report, TR2005-046, December 2005. A Measurement-Based Skin Reflectance Model for Face Rendering and Editing. Tim Weyrich, Wojciech Matusik, Hanspeter Pfister, Jinho Lee, Addy Ngan, Henrik Wann Jensen, Markus Gross. Mitsubishi Electric Research Laboratories (MERL) Technical Report, TR2005-071, July 2005. A Practical Structured Light Acquisition System for Point-Based Geometry and Texture. Filip Sadlo, Tim Weyrich, Ronny Peikert, Markus Gross. In Proceedings of Eurographics Symposium on Point-Based Graphics 2005, pp. 89–98, Stony Brook, USA, June 21–22. Rendering Deformable Surface Reflectance Fields. Tim Weyrich, Hanspeter Pfister, Markus Gross. IEEE Transactions on Visualization and Computer Graphics, Vol. 11, Issue 1, pp. 48–58, Jan–Feb 2005. Robust Watermarking of Point-Sampled Geometry. Daniel Cotting, Tim Weyrich, Mark Pauly, Markus Gross. In Proceedings of International Conference on Shape Modeling and Applications (SMI), pp. 233–242, Genova, Italy, June 7-9, 2004. Post-processing of Scanned 3D Surface Data. Tim Weyrich, Mark Pauly, Richard Keiser, Simon Heinzle, Sascha Scandella, Markus Gross. In Proceedings of Eurographics Symposium on Point-Based Graphics, pp. 85–94, Zurich, Switzerland, Jun 2-4, 2004. Using a Panoramic Camera for 3D Head Tracking in an AR Environment. Björn Giesler, Tobias Salb, Tim Weyrich, Rüdiger Dillmann. In Proceedings of 9th IEEE Int. Conference on Mechatronics and Machine Vision in Practice, Chiang Mai, Thailand, Sep 10-12, 2002. Entwicklung eines Kopfverfolgunssystems auf der Basis einer Panoramakamera und künstlicher Landmarken. Diplomar thesis, Institut für Prozessrechentechnik, Automation und Robotik, Universität Karlsruhe (TH), June 2001. Interactive simulation of teeth cleaning. Tilo Gockel, Tobias Salb, Tim Weyrich, Rüdiger Dillmann. CARS 2001, 7th Computed Maxillofacial Imaging Congress (CMI), June 2001, Berlin. Haptic mediation of risk potentials over a soft tissue data set. Tobias Salb, Tim Weyrich, Oliver Burgert, Rüdiger Dillmann. The First PHANToM Users Research Symposium (PURS), May 1999, Heidelberg. Preoperative Planning and Training Simulation for Risk Reducing Surgery. Tobias Salb, Tim Weyrich, Rüdiger Dillmann. International Training and Simulation Conference (ITEC), April 1999, The Hague, The Netherlands. Bewertung und Optimierung von Schnitten in Weichgewebe – ein risikobasierter Ansatz. Semester thesis, Institut für Prozessrechentechnik, Automation und Robotik, Universität Karlsruhe (TH), January 1999.